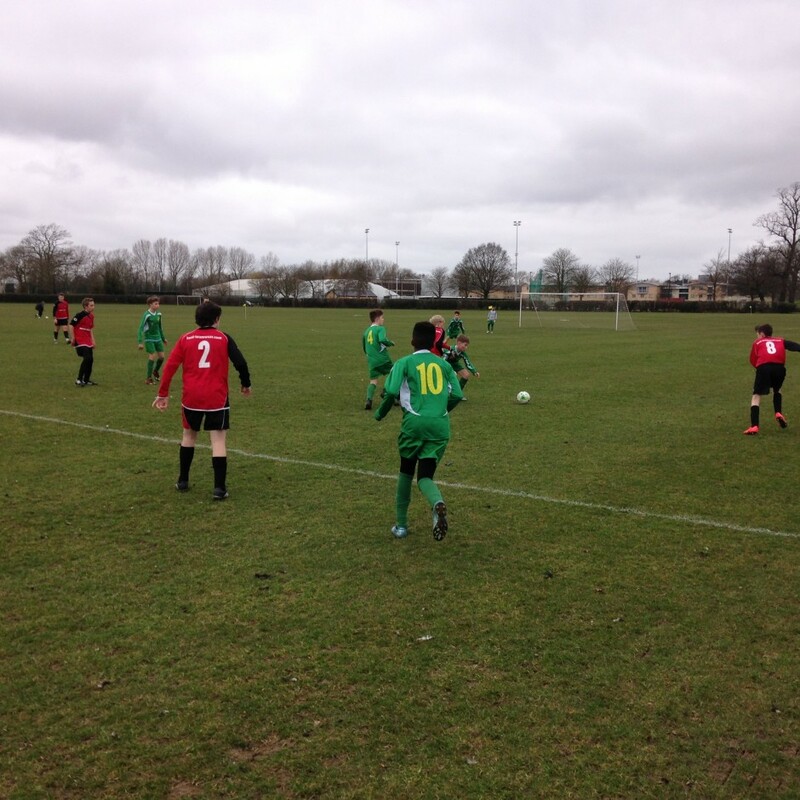 York U13s resumed league action, after a lengthy lay off, with a home game against Nottingham. York started preceding’s and went straight on the attack forcing a goal kick in the first thirty seconds, and Ban Calam forcing a save in the 2nd minute. Yorks midfield quartet of Elliot Oliver, Liam White, Connor Teal and Harvey Stephenson dominating the physical battle with the latter having to be replaced in the 7th minute by Sid McCoy due to injury. Minutes later Sid McCoy tested the Nottingham shot stopper from long range before Luke Jones cutting back a cross from the by-line which eluded the Nottingham defence and keeper for Elliot Oliver to be on hand at the back post to side foot into the net putting York 1-0 up in the 11th minute. York were defending from the front with solid support from the midfield and minutes later after York had won the ball from a Nottingham goal kick Ben Calam played a defence splitting pass on the edge of the 18-yard box which was collected by Luke Jones to slot past the Nottingham keeper making it 2-0 on 17 minutes. From the kick off, a combination of York easing off and Nottingham stepping up a gear put the York defence under real pressure which allowed Nottingham to replicate Yorks first goal with the Nottingham forward cutting the ball back across goal from the by-line for the onrushing Nottingham player to bravely put them back in the game narrowly missing the far post as he side footed the ball into the net on 18 minutes making the score 2-1 in the first 20 minutes and game on. For the last 15 minutes of the first half Nottingham had the upper hand with Leo Jones, Ben Rhodes, Alfie Evans and Olly Hanley working hard to keep the Nottingham strikers to only two shots off target with Joseph Hodge clearing up any loose balls but a relative by-stander as Nottingham failed to make their possession count as the first half finished 2-1. Nottingham kicked off the second half, continuing their pressure from the first half, but found Alfie Evans, Olly Hanley, Ben Rhodes and Leo Jones resilient under pressure with York hitting Nottingham on the break. A 20-yard free kick from Luke Jones, destined for the top right hand corner was acrobatically saved by the Nottingham keeper, as the Nottingham defence restricted York to long range efforts as the game evened up. Joseph Hodge in the York goal was called into action for the first time in the 10th minute of the second half saving well from the Nottingham forward; but could do nothing about the Nottingham equaliser in the 50th minute as the Nottingham pressure finally paid off for them putting the scores level at 2-2. From the restart York upped the tempo and were rewarded when Luke Jones through on goal hit a sweet shot that the keeper could only parry and was first to react putting the ball in the net from 3 yards in the midst of a scramble in the 53rd minute, putting York back in front at 3-2. Minutes later Ben Calam hit the left hand upright with the Nottingham defence scrambling the rebound away. A 63rd minute free kick taken by Alfie Evans was picked up by Liam White who driving at the defence calmly slotted the ball past the Nottingham keeper putting York in the driving seat at 4-2 in the 63rd minute. Minutes later Ben Calam running onto a Luke Jones Through ball was involved in a collision with the Nottingham defender and keeper in the penalty area but appeals for a penalty were waived away with the York attacker having to be replaced by Harvey Stephenson through injury. 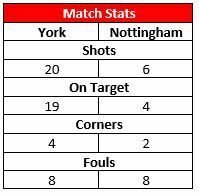 York were now controlling the game; but Luke Jones and Liam White found the Nottingham keeper in great form as he denied them, saving well from a multitude of shots from the attacking duo, with Liam White trying a cheeky chip that the keeper did well to catch and gather in. A 69th minute goal mouth scramble started by Luke Jones who’s shot struck the left hand upright and was first to react to the rebound, cutting the ball back to Liam White who saw his point blank shot somehow saved by the keeper for the resulting parry to be lifted into the roof of the net by Harvey Stephenson putting York 5-2 up. From the resulting kick off Nottingham attacked but a clearance from Joseph Hodge, flicked on by Liam White was chased down by Luke Jones and driving into the box calmly stroked the ball under the advancing keeper to bag his hat-trick and put York 6-2 up in the dying minutes of the game. Managers Comments (Alan Oliver / Neil Stephenson): well done to all, carry on playing brilliant football. Let’s carry on with the winning mentality. Men of the Match was awarded to Luke Jones & Alfie Evans. Scorers: Luke Jones 3, Oliver, White, Stephenson. Squad: Hodge, Rhodes, Leo Jones, Hanley (C), Evans, White, Stephenson, Oliver, McCoy, Teale, Luke Jones, Calam.